For the seventh year in succession, members of the Rotary Club of Cranleigh have been helping to bring smiles to the faces of hundreds of disadvantaged children at Christmas by supporting the collection of colourful shoe boxes for Romania. 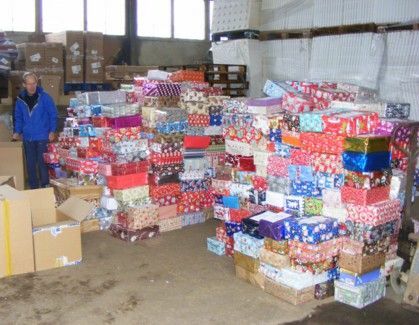 The students of Glebelands Secondary School, St Cuthbert Mayne Primary, Cranleigh Church of England Primary, Cranleigh Preparatory School and Park Mead Primary School once again surpassed themselves, donating more than 600 shoe boxes filled with Christmas gifts. Glebelands School pupils alone helped to collect 270 shoe boxes filled with toys, sweets, stationery and other goodies. The collection was organised by Cranleigh Rotarians who contacted the schools, collected the shoe boxes and helped to load them onto a lorry at a warehouse in West Cranleigh Nurseries, which was kindly made available by Nic Vrijland, an Honorary Member of the Cranleigh Rotary Club. Altogether, local schools, churches and other organisations brought the overall total of shoe boxes from the Cranleigh area to about 900. These are sent to orphans, and other deprived and disabled children who live in and around the old Romanian steel town of Hunedoara and who have few, if any, other presents at Christmas. The shoe boxes are transported and distributed by Diana and Corneliu, who live in the old steel town of Hunedoara in Romania and founded the Betel Centre, a Christian social centre in the town. 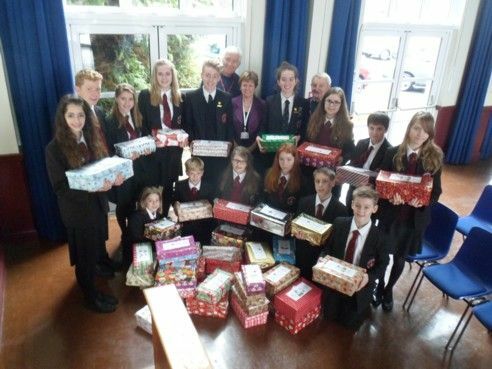 David Reed, International Chairman for the Cranleigh Rotary Club, thanked all of the schools and students for once again donating such a huge number of "little boxes of happiness", as one pupil described them. Photo captions: (Top) Pupils from Glebelands School with some of their collection of shoe boxes. (Bottom): A pile of shoe boxes ready for shipment.